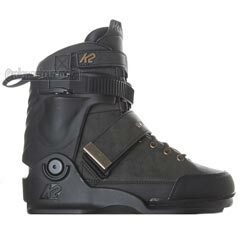 Athlete-approved and the flagship of the K2 Aggressive series is the Unnatural aggressive inline skate, geared for hard-charging skaters looking to push the boundaries of the sport. Built around a rich, black leather-textured upper, the Unnatural features a reinforced SoftBoot® construction to the upper, and the combination of a ratchet buckle cuff closure and replaceable mid-foot powerstrap. It also has the added comfort benefits of a shock absorbing foot bed. We went back to the drawing board and came up with a completely redesigned 1- piece soul for extra durability, with Teflon® inserts that reduce friction and allow you to slide almost any surface. K2: True to size fit. Average width.